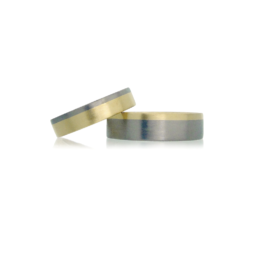 Like the Arc design, the Saturnian wedding bands allow you to choose two colours, or metals, which come together in a complementary way. 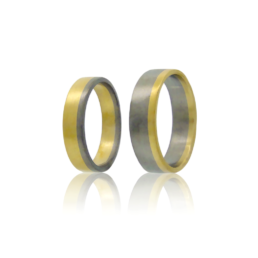 If commissioning two rings, it is possible to have either matching colours or inverse styling. Profiles and width can be customised. Choose from a palette of colours in 9k, 14k and 18k Fairtrade Gold, all of which are all hand-alloyed. Recycled Palladium and platinum are also available. 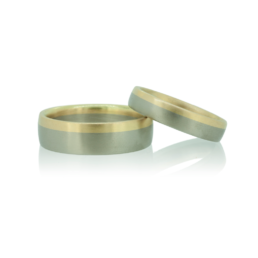 Fairtrade Silver, 9k Fairtrade Gold and 100% recycled Platinum is also available. Gold and Silver certified to Fairtrade Standards.